The first recording of Bernd Alois Zimmermann's Concerto en forme de pas de trois respecting its original instrumentation with glass harp. 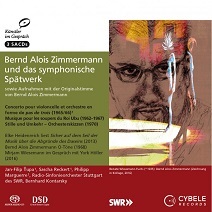 Reference recordings of Bernd Alois Zimmermann's late symphonic oeuvre with SWR radio symphony orchestra Stuttgart under Bernhard Kontarsky. 3 SACD edition with 146 mins of bonus material and a 88-page booklet. Awarded the 2017 Jahrespreis der deutschen Schallplattenkritik. Top rated with Opus d'or and 5/5 starts at pizzicato.lu. Erik Bünger's interpretation of a 1948 occult recording found by researcher Thomas Knoefel in the Society for Psychical Research archive in London. Performed by Jan-Filip Ťupa on cello solo. Jacqueline Fontyn's cello concerto Colinda has been released by Cybele on this exquisit 3 SACD edition. Artists: Göttinger Symphonieorchester, Christoph Matthias Müller conductor, Jan-Filip Ťupa cello, et al. CD with chamber music by Thomas Stiegler and Peter Ablinger. CD with sonatas for cello and piano by G. Fauré, B. Martinů and B. Britten. Jan-Filip Ťupa cello, Seon Joo Kim piano. Sample: first movement Allegro from the sonata op.117 by G. Fauré. Three times seven transformations of a work of art exclusive handstitched volume with seven poems and seven miniature graphics from the cycle Grand Central by Rodrigo Rojas, the facsimile of the handwriting of the score of the seven Solos for cello by José Ignacio Fernández Bollo and a CD with the recording of the seven Solos by Jan-Filip Ťupa. 36 pages, limited and numbered from 1 to 300. Note: The poems are written in Spanish. The CD is also available separately. CD with seven Solos for cello by José Ignacio Fernández Bollo. Total playing time: 13 min. This CD is included also in Veintiuno. Master classes with 6 young cellists. Jan-Filip Ťupa is playing the Suite No.5 for cello solo BWV 1011 by J.S. Bach. The DVD with Bernard Greenhouse is available at Cello Classics , both 3 SACD editions Jacqueline Fontyn and Bernd Alois Zimmermann at www.cybele.de or in any well-assorted record store. The other CDs and the collection of poems can be ordered directly sending send a brief message with your address and your preferred way of payment. * Shipping costs are included. VAT is not deductible. money transfer to a German bank account or through PayPal.